The tougher US geopolitical course was not a straight line though. Just after President Macron managed to get some concessions from the USA on some issues, the United States hardened its position after Chancellor Merkel – lacking the diplomatic skills of President Macron – used several occasions to openly defy Washington. She could have done this more quietly, but she chose to somehow embrace the regime in Teheran and President Vladimir Putin in a somewhat defiant way. Having said this, Germany sees itself in the rightful position to question and challenge the USA, and to build closer relations with America’s arch rivals. Germany may not have a great military might nor a Veto in the UN Security Council, but it is probably the most impressive “economic machine” in the world and is also the most welcome Western power in all corners and conflict regions of the world. Washington may not like it, but Germany is more trusted than America. That is real soft power. Sure, this comes in part from being an economic might, but posing no military threat to anyone. Still, Germany is a rising power that is likely to defy the United States in an increasing way in decades to come. Germany may not have a military deterrence nor nuclear weapons, but her conditional allies Russia and China do. Based on our independent geopolitical research, we believe that Europe has begun to challenge the United States of America prematurely. Where Europe has a big problem and vulnerability is that it cannot defend herself effectively until 2024. She is defying the United States, while expecting America’s full commitment to protect Europe (we have called it an asymmetric NATO). European leaders were so convinced about the decline of the USA and the rise of China as new super power, that European leaders scoffed openly at President Trump and hailed President Xi Jinping as their new champion and protector of the Liberal World Order. Just months after that America is showing its less gentle super power might. We deem Europe in a vulnerable spot until 2024. Neither is America out yet and nor is China dominating the world yet. Not that we believe China will overtake the United States – as consensus is so convinced about. Europe is now easy prey to Middle Eastern or Oriental powers. We actually believe the USA is in a resurgent mode. Europe has challenged the USA, but how much can Paris and Berlin really rely on their new circumstantial allies China, Iran and Russia? Germany believed that in our post-modern times and with flourishing trade, economic might means influence. 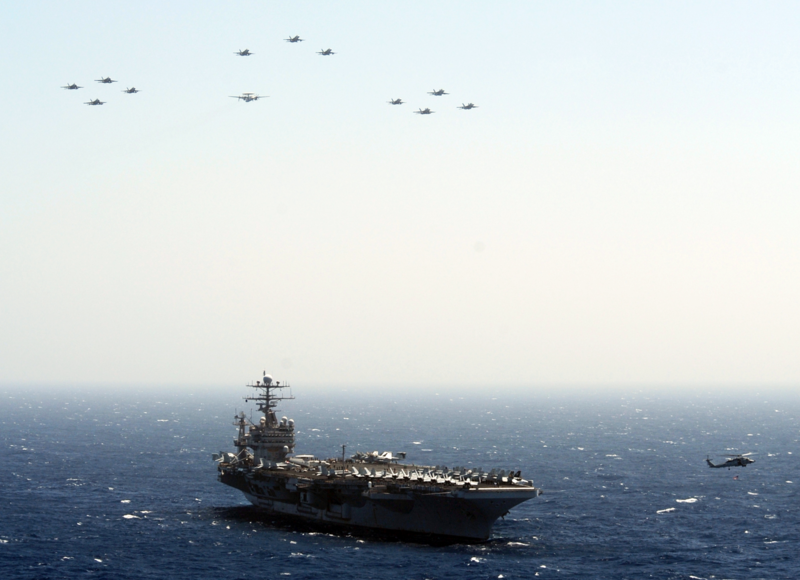 Unparalleled military might: One of 11 US Aircraft Carrier Strike Groups at an undisclosed location in the Atlantic. The US Carrier Groups are tactically complemented by 9 Amphibious/Marine Expeditionary Groups. Note: None of our analyses should be interpreted or construed as an investment recommendation. Our newsletter can be subscribed to on our website.